Fred. 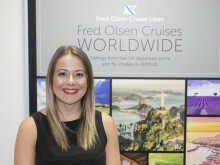 Olsen Cruise Lines has launched a promotional sales campaign on 18 digital TV channels, which will run until 24th January 2015, to showcase its ‘The more you book, the more you save’* cruise sale, its innovative ‘Enjoyment Promise’* and its wide range of regional UK departures. Fred. Olsen’s TV campaign is also supported by a comprehensive mix of print, radio, online and social media promotional activity. For further information on Fred. Olsen Cruise Lines, visit the website at www.fredolsencruises.com Book online, call Reservations on 0800 0355 242 (Monday – Friday, 8am – 8pm; Saturday, 9am – 5pm; Sunday, 10am – 4pm), or see an ABTA travel agent. 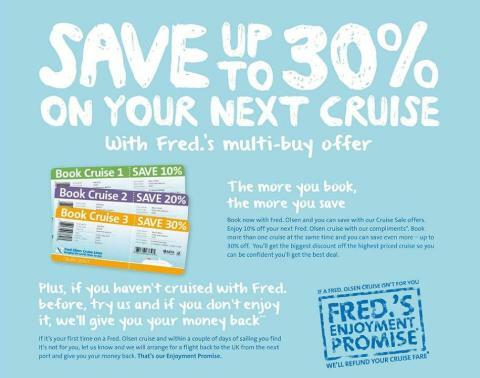 fred.s cruise salefred. olsen’s ‘turn of year’ sales campaigns enjoyment promise,fred.